When a special request comes for April and Esme to make their first official tooth fairy visit, they have to start by convincing their folks that they are old enough to go. But with some parental advice, a carrying bag, and warm coats, the girls are off to pick up their first baby tooth. 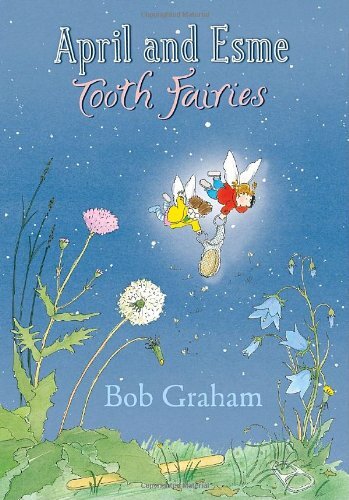 They have some challenges, but meet them to become true tooth fairies. The story is very cute, but I’d give the true honors to the imaginative illustrations by Bob Graham. Because these aren’t your living-in-a-buttercup fairies. Oh, no. They have cell phones, hair dryers, and a home office. Dad is hanging the laundry to dry in front of the fireplace — including mom’s bra! These are fairies who seem just like humans, but smaller... and with wings. This interpretation adds a freshness to a magical tale. Consider giving this book as a gift along with a make-your-own tooth keepsake box, or look for 105 other ways to give a book. I recommend The Apple Doll by Elisa Kleven. The book has instructions at the end for how to make your own (be careful, the nose is tricky!). A big fat yes for Snip Snap! What's That! Every time I read that one, the kids love it. Other "A" books I like are Always by Alison McGhee or All Together Now by Anita Jeram. Thanks for sharing a great story time plan. How cute! Making an order card right now (and we have time to get and use it for the letter T in the spring!) "I saw an Ant" has been a big hit here for story time. We also like "Truman's Aunt Farm" by Jama Rattigan. I LOVE Abiyoyo by Pete Seeger. Alexander and the Terrible, Horrible, No Good, Very Bad Day! Not only good for a fun story, but for adjectives and for the rule of three for young writers! Finding an "a" book was harder than I thought it would be. I like Animals are Sleeping by Suzanne Slade. It has rhyming text which is great for read-aloud, and it also has details about animal behaviors that kids can model (and learn about, too). I think Bob Graham is British--a favorite title of his at our house is "Has Anyone Seen William?" For another A (and another Brit) look for Quentin Blake's "All Join In!" A makes me think of All the World by Liz Garton Scanlon. I am also a big fan of Snip! Snap! Ten Apples Up on Top is my own favorite A book! We have one called "Animal Families" and it is a hit.